The DidyKlick from Didymos is a half-buckle Meh Dai carrier with a buckle waist and wide, spreadable shoulder straps. The body and straps of the carrier are made from organic cotton Didymos Chili wrap fabric. The DidyKlick is fully adjustable and suitable for babies / toddlers from 3kg - 20kg. When I first started looking into baby wraps, Didymos was one of the names that my babywearing friends immediately suggested I try. Sure enough, one of my very first wraps was a 'Didy', and my first Meh Dai a 'DidyTai' so I'm always really excited to be offered the opportunity to test and review their products. By now, you’ve probably cottoned on to the fact that I have a fondness for woven baby wraps! The Wrapping Years was founded on my love of (borderline obsession with!) those wonderous pieces of fabric & there’s not much that gets me more excited than a wrap arriving in the post... but when the lovely people at Didymos asked me whether I’d like to test and review their new half-buckle DidyKlick I couldn’t wait for the postman to arrive! It’s always lovely to try something new and I was intrigued to see how the half-buckle DidyKlick performed in comparison to my beloved wraps. Of course, the fact that it’s made from gorgeous Didymos wrap fabric was an auspicious start! There’s a range of DidyKlick’s available so you can choose the one that appeals to you most. The qualities of the fabric are just as much present in the DidyKlick as they are in wrap form. In the case of Chili, vibrant chilli red and white threads alternate in a plain criss-cross weave creating a sturdy, fine textured fabric. There’s a depth of colour that’s tricky to capture but at a distance the colours merge to create an attractive salmon pink. Chili had a slightly stiff finish at first but softened up very quickly. Anyone enjoying the company of a small person who loves to demonstrate the efficiently of their wrap seat popping - usually at the most inconvenient moment possible - will immediately see the appeal of a buckle waisted carrier. The attempts of even the most accomplished escapee will be foiled! The speed and ease of clicking a clip waist into place is also a major benefit for anyone short on time or available hands (i.e. all parents and carers!). So how does the DidyKlick measure up? It has a fairly firm but slim (about 8.5cm tall and 1.3cm thick) padded waist belt that’s highly adjustable and will fit most adults. Didymos say it’s suitable from UK size 6 - 24 and I believe them. I’m a size 16-18 and had oodles of unused belt, yet at its smallest it will fit the most petite of people. The extra length can be neatly tucked away so there’s no issue there. As the belt is only adjustable from one end, you only have one belt ‘tail’ and the buckle always rests to one side against the padded waist. This prevents the buckle digging in and also looks much neater. It has no impact on the ease of fastening. You secure the waist belt before picking up your little one and can therefore rotate the carrier to whichever position suits you. The body panel (excluding the hood and waist band) measures roughly 41cm wide by 36cm tall and has light padding at the edges of the seat ensuring a comfortable ride for your little one. The DidyKlick seat can be easily cinched in by pulling a drawstring and toggle, making it suitable from newborn. At 15 months, my long legged little boy was perfectly knee-to-knee with the panel at its widest. The DidyKlick can be used for front carries from birth and for hip or back carries from 4 months, or as soon as your baby can hold their head up. A collection of handy tutorials can be found here. The carrier has an integrated headrest that can be adjusted by draw strings and fastened through loops on the shoulder straps by poppers (snap fastenings) to act as either a head support or moulded sleep hood. The DidyKlick has wide, fabric straps that spread the weight across your shoulders and, in conjunction with the support of the structured waist, make for an extremely comfortable carry. I experienced none of the pulling or digging I often get over time with a full buckle carrier’s straps and the wide fabric DidyKlick straps can be tied off pretty much however you want. 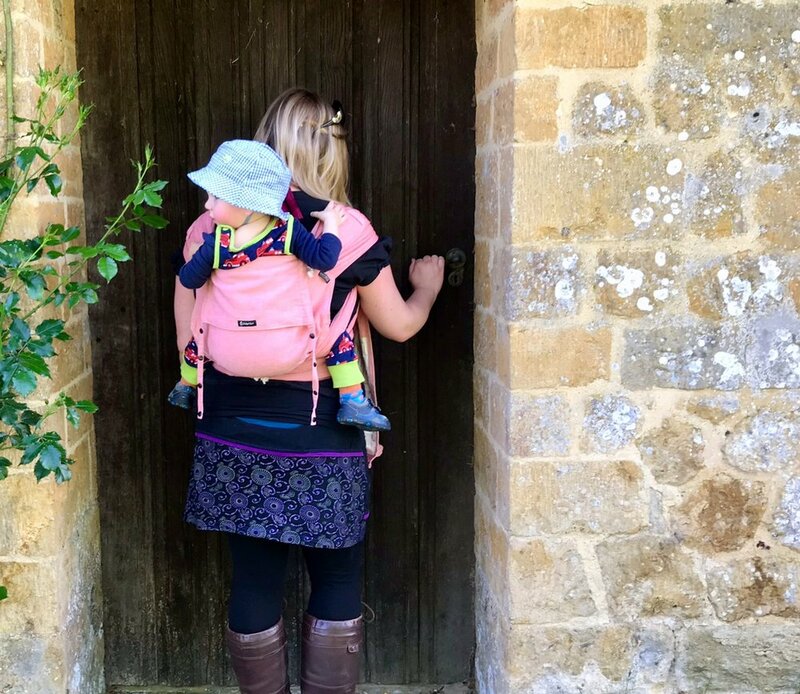 Fancy wrap-style finishes are easy, look awesome and avoid the less than flattering look that full buckle carriers can give, when back carrying, to ladies like myself blessed with ample frontage! We’ve been enjoying some hot, humid weather while testing the DidyKlick and have found it extremely comfortable and airy, even when carrying for long periods of time. Dare I say it, in these temperatures, my little boy seems to prefer it to more enclosed wraps. The DidyKlick would be an ideal choice for holidays or for festivals where you’d rather avoid wraps trailing in the mud. It is in fact a fantastic, supremely practical and comfortable option that just happens to look really lovely too. I’m seriously impressed and rather in love with the DidyKlick! It’s an extremely comfortable and well designed carrier that combines the ease and security of a structured, buckle fastened waist with the comfort, versatility and beauty of wide wrap fabric straps. Perfect from newborn to toddlerhood, it’s a fantastic option for new and ‘battle-hardened’ parents alike. The range of DidyKlick’s available to buy, including Chili, can be found on the Didymos website. You can also follow Didymos on Facebook & Instagram to get the heads up about their news and new releases.